This is a flip-card for a friend's birthday. She rides horses so I thought this patterned paper (Sasparilla by October Afternoon) would be perfect. The sentiment is from "Listen From the Heart" a Phyllis Harris set. I am sorry that I did not look at these photos before I sent the card. Such weird angles and the lighting is off. UGH! Love your flip cards! Didn't notice the lighting problem 'cause it's so cute. 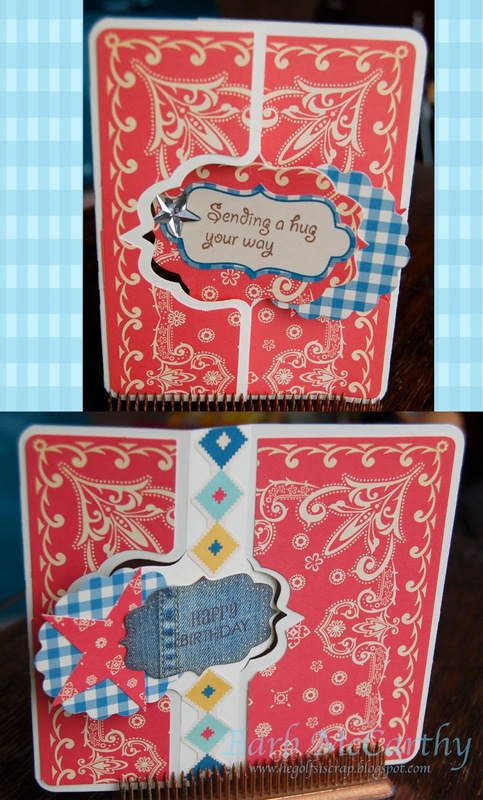 Fun design and mix of papers, Barb. Love this flip card. Great colours and design. Perfect card for your horse loving friend. What a great flip card. Love that paper! What a fun flip card. Yeeehaaa. Nice card for your friend. What a cool flip card. I'm sure your friend will love it! Your paper is perfect for your horsey loving friend. CUTE design!! !